PO Box 182, Cammeray. NSW. 2062. AUSTRALIA. Created with the sole purpose of disseminating knowledge about polymer bank notes. This site has been designed to allow viewers to print any of the information pages, in portrait orientation. Should a page not suit your printer, try landscape orientation. Trevor Wilkin attends major banknote shows throughout the world, buying and selling banknotes, paper and plastic. Visit him at a show near you or peruse his paper and polymer Sales List on this site.. He also conducts extensive research into polymer and other plastic notes encompassing designs, proposed printings and actual issues. Further research details. He has a comprehensive listing of polymer and other plastic note issues plus an extensive range of world paper notes. This site covers both these areas commencing with the more specialist polymer (and other plastic issues) and then general world. His General List covers a broad cross section. 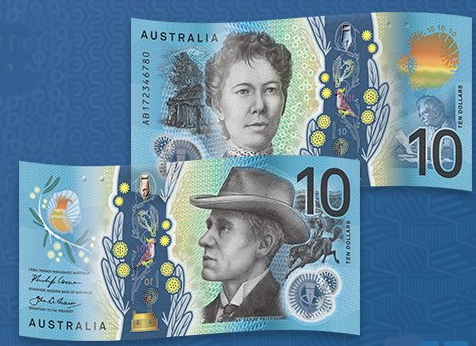 The Polymer section is extensive covering all issues arising from NPA polymer technology (but not including all Australian date varieties).There are now 21 countries issuing polymer notes with over 50 distinct issues and well over 100 with all Australian varieties. Other plastic such as the ABNC tyvek issues of the early 1980's sell very quickly and are always wanted. If there is nothing on this List which suits, Please feel free to contact me indicating your areas of interest or "Wants". Want Lists and standing orders are actively serviced for both paper and polymer issues." This web site is for informational purposes only and is not intended to provide specific commercial, financial, investment, accounting, tax, or legal advice. It is provided to you solely for your own personal, non-commercial use and not for purposes of resale, distribution, public display or performance or any other uses by you in any form or manner whatsoever. Unless otherwise indicated on this web site, you may display, download, archive, reformat and print a single copy of any information on this web site for your own personal, non-commercial use.